Quinoa is one of those ingredients that I have a TON of in my pantry but never find myself using. I just prefer rice so much more as my grain of choice and didn’t really know what else to use it for. This huge container of quinoa was just sitting there and I knew it had to be used! Quinoa gives volume, texture and body so I thought why not in stew? It was a solid choice. I went with the curry route because I’m just in love with all things curry. I added lentils to give it another texture, coconut milk for creaminess, tomatoes for acidity, and just a tad of spinach for some extra health. I highly recommend using full fat coconut milk for this recipe, it makes a huge difference that I promise you won’t regret! There is no oil used in this recipe anyways, so it’s definitely a good idea to add in some healthy fats. Remember to stir the stew every 3-5 minutes when allowing it to simmer so the bottom does not burn. If it looks like it needs a bit more liquid, add 1/2 a cup and check on the texture of the lentils! This will depend on how liquid-y your coconut milk and canned tomatoes are. This is a great meal prep/freezer friendly meal! It will last in the fridge up to 5 days and in the freezer for 2 months. 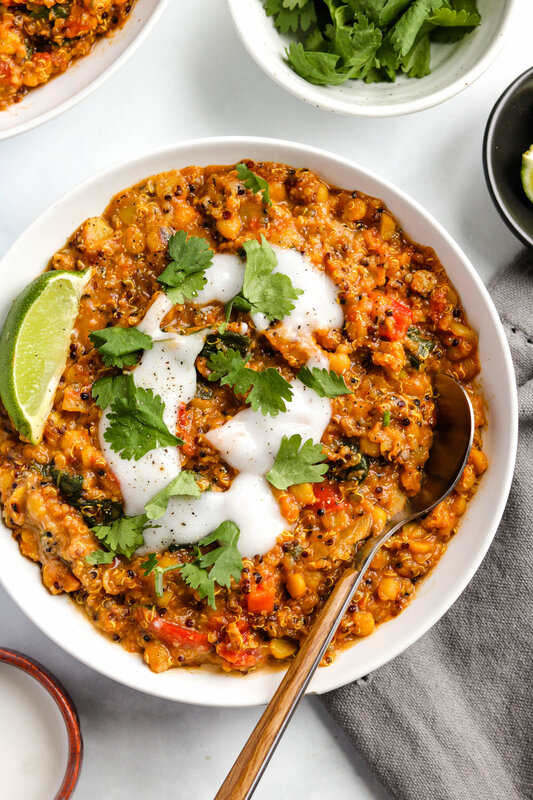 If you recreate this Curried Quinoa & Lentil Stew please share it and let me know what you think by tagging me on Instagram @lisakitahara, I love seeing all of your tasty recreations! On medium high heat, add onions, garlic and ginger into a large pot and fry for 1 minute. Add in the curry power, cumin, graham masala and fry until fragrant (around 3 minutes). 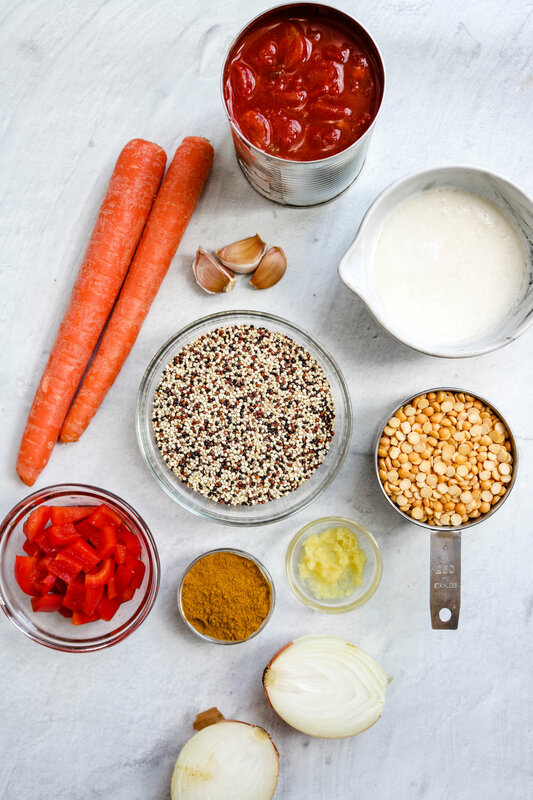 Add in the diced tomatoes, carrots, vegetable broth, coconut milk, split years, quinoa, salt and pepper. Give it a stir, allow it to come to a boil and then bring the temperature down to low. Cover, and allow to simmer for 20 minutes (stirring occasionally), or until lentils are cooked through. Add in the spinach and allow it to wilt down. Season with salt and pepper. Serve in a bowl and garnish with cilantro, green onions and coconut yogurt. Enjoy! * most lentil varieties require similar cooking times. Green/brown lentils may need an additional 5 minutes. If using split peas, increase cooking time by 20-25 minutes.